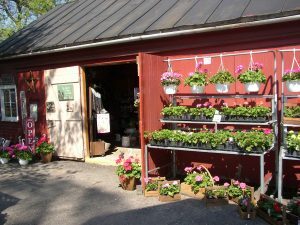 Every spring, we welcome the warm sunshine by opening our Gardens and “Garden Barn”. The historic barn is stocked with great accessories for any porch or patio. 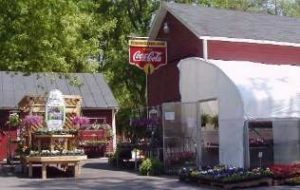 You’ll find he Garden overflowing with gorgeous hanging baskets, as well as a huge assortment of potted plants and perennials. We re-open every year on May 1st! Our historic carriage barn is bursting at the seams, as we’ve filled it with accessories for your decks, sun porches, and outdoor living spaces. There are funky signs and planters, primitive accents, unusual birdhouses, and garden stakes galore. These cheerful additions will surely put a smile on your face! It all starts on May 1st and we keep things rolling through Father’s Day weekend! 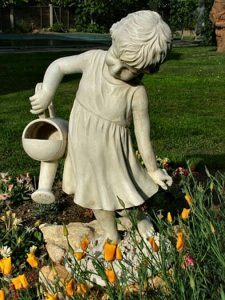 Whether you are looking for a great looking weathervane or an unusual fountain for that special place in your landscape, the Dixboro Gardens is the place to search. Roam thru our yard displaying an exceptional collection of planters, birdbaths, furniture, and garden ornaments while enjoying the beauty of our locally grown annuals and perennials.